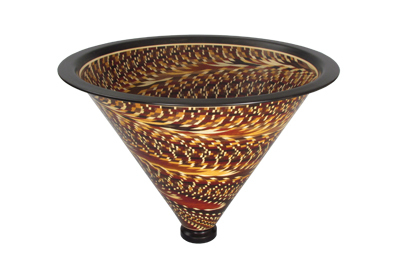 I have always been impressed by the patterns that are portrayed in American Indian basketry and have attempted to replicate some of these in woodturning. For this piece, I chose a stepped pattern that I had recently seen on a basket. 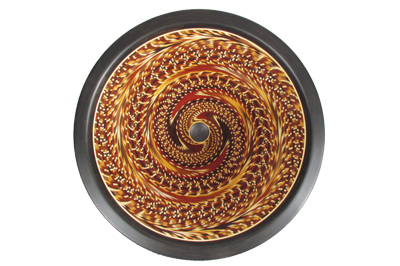 I wanted this bowl to portray the swirling motion of a cyclone. This necessitated a tall bowl with steep angled sides. I also wanted the bowl to be proportioned for exhibition in a large environment, i.e. 533mm diameter and 381mm high. This shape proved quite challenging to turn. I experimented with ways of constructing a stepped pattern of various colours that would generate a bird's wing effect. Various width strips of natural coloured woods were glued together to form sheets equivalent in size to the maximum diameter of the bowl and 5mm thick. Rings were cut out of each sheet in decreasing diameters and stacked 66 layers high. The process is similar to a bowl-from-a-board technique, but requires many identical thin sheets to get sufficient rings to construct the bowl. Rotating each ring through a set angle caused the pattern displacement to diminish as it approached the centre of the bowl, thus generating the cyclonic effect. Looking into the centre of the bowl, one can see the swirling cyclonic effect that draws the eye downwards to the black hole at the bottom. Observing it from a side view shows many patterns including the wings. One of the first questions I get asked is: "Did you design this on a computer?" The answer is no. After formulating the initial concept in my mind, I developed the desired technique through experimentation over about six months. The bowl is made up from around 5,500 individual pieces of wood and some of the woods used include yellowheart (Euxylophora paraensis), African ebony (Diospyros spp. ), pernambuco (Caesalpinia echinata), imbue (Ocotea porosa), American black walnut (Juglans nigra), holly (Ilex spp. ), bloodwood (Brosimum Paraense), and East Indian rosewood (Dalbergia latifolia).